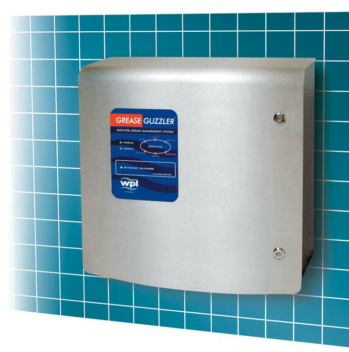 The Grease Guzzler® is an innovative, self contained solution to grease management. Designed for any environment where Fat, Oil & Grease (FOG) can cause blockages in waste pipes or drain runs. The system utilises patented bio-technology, ensuring efficient and effective drain cleansing with minimal impact on the environment. In an environment where cooking oils and fats are used in large quantities, it is often difficult to imagine the high volume of grease that finds its way into the drainage system. Grease build up can be problematic even to the best designed drains. The most commonly associated symptoms are an increased sight of vermin and insects and the presence of a foul and rancid smell, which becomes unpleasantly potent in warm weather. The final and most costly indication of grease build up is a blocked drain. At a pre-programmed time, usually once a day, the Grease Guzzler releases a unique biological cleaning solution into the drain line. This is developed within the machine from a concentrated ‘bio-fluid’ formulation called S65™. Each cycle begins with a dose of S65 bio-fluid concentrate into the incubation tank filled with cold water. The tank is gently heated for eight hours to stimulate the micro-organisms to multiply, resulting in the creation of a rich soup of grease hungry bacteria. Food scraps and peelings should be prevented from entering the drain by installing a simple mesh screen at the drain-head. If allowed through, the bio-products will 'eat' the scraps, but this may diminish their concentration around the grease. We do not recommend the use of garbage grinders. These simply macerate the scraps into a pulp, increasing their surface area and providing an even more attractive food source for microbes. Once the system has dosed, the pipe work will be left with a culture of grease degrading micro organisms that continue to actively prevent the build up of any grease that finds its way into the drainage system during the dosing off periods. S65 concentrate is the result of over ten years research and development into biological grease management. It comprises of a purposely selected and naturally occurring cocktail of non-pathogenic enzymes and micro-organisms, forming a mixed culture composite. This improves the Grease Guzzler's ability to combat the many different forms of grease that are commonly found in commercial kitchens. S65 uses two simultaneous processes. Enzymes make the first assault, breaking the grease into simpler food particles, which are edible to micro-organisms, these then digest and degrade the grease further. As the hungry micro-organisms grow, they reproduce rapidly by splitting, which at the same time releases more enzymes to perpetuate the process until all the grease is broken down. The result is the conversion of grease into fatty acids and glycerol; water soluble products that form an emulsion. Harmless to the drain, this transformation is irreversible. As these products continue their way to the the main drainage network, degradation continues until the grease is broken down into carbon dioxide and water. Where should the Grease Guzzler® be installed? The Grease Guzzler is designed to be sited in any kitchen, other than domestic properties, where fats, oils and grease can potentially lead to blocked drains. It is designed for mounting on to an internal wall, normally in the kitchen, close to the drainage waste pipe. Connections are very simple - cold water and electricity in, drain access out. Grease Guzzler has been engineered for complete reliability. Absolutely no user maintenance is necessary. In order to keep kitchen disruption to a minimum, a six monthly supplier service and refill programme is all that is required. This will be managed and undertaken directly by ourselves, who will provide a fully-inclusive, fixed price agreement upon which you can depend. – fully comprehensive parts a nd labour agreement. Formulated to combat the different types of FOG (fats oils and grease) found in commercial kitchens, it comprises 58 different types of bacteria, producing a naturally occurring cocktail of enzymes and micro-organisms, rigorously screened to eliminate pathogens. Introducing the Grease Guzzler ® - a high performance biological dosing system employing exclusive incubation technology to keep kitchen drains grease and odour free.